New metal crosses as they appeared on the square last year. American Legion Post 30, Edgefield, SC will host a Ceremonial Retirement of the P.O.W. (Prisoner of War) and K.I.A. (Killed in Action) Wooden Crosses on Thursday April 21, 2016 at 5:30 pm at the American Legion Post 30, in Edgefield, SC. History of these Wooden Crosses — Many years ago, Mr. John Pettigrew Sr had seen similar crosses displayed in a small town in Georgia. He shared the idea with American Legion Post 30 Commander Mr. Matthew McGinnis and work began immediately to honor and remember our county Veterans who sacrificed their lives as POW’s or KIA’s. Mr. John Rikard, our Veteran Affairs Officer obtained the names of all service members listed as P.O.W. or K.I.A. from Edgefield County. 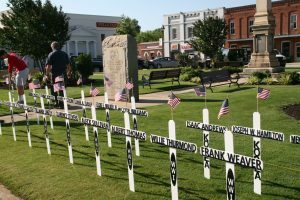 The American Legion provided the materials for the crosses and inmates from the Federal Prison Camp constructed, painted, added the names, wars and dates to the crosses. These crosses were first displayed on Memorial Day on our Town Square. An appropriate ceremony took place and was attended by family members of the fallen Veterans, American Legion Members, the Public and various news agencies. Over the years, these wooden crosses have become weathered and tattered. The time has come to retire these crosses in a dignified manner. Last year, Bill Cheatham’s Strom Thurmond High School Welding II students chose a community project for 2015, to design and make new crosses which will last forever. These Welding II students delivered and installed the new crosses on the Town Square on May 20, 2015. These new crosses will continue to preserve our tradition to remember and honor our P.O.W. and K.I.A. service members from Edgefield County.